The British Empire Games had been held for the first time in 1930 in Hamilton, Ontario, then followed London in 1934 and Australia in 1938. The series was interrupted by the War years and the first gathering after the War was in 1950. Although the fourth Games were originally to be held in Montreal, Canada, in 1942, they were held in Auckland, New Zealand between 4th and 11th February 1950. The main venue was Eden Park although the closing ceremony was held at Western Springs Stadium. As home nation they had 175 competitors out of 590 competitors in total from 12 countries. The New Zealand flag-bearer was Harold Nelson about whom we will hear more later. At these Games, the very small Scotland team won ten medals in total – five gold, three silver and two bronze with athletics providing three of them. 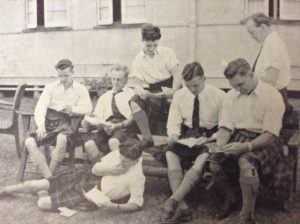 The athletes selected who travelled halfway round the world were Andy Forbes (Mile, Thre Miles and Six Miles, Ian Garrow Maclachlan Hart (120H and 440H), Allan Shanks Lindsay (Triple Jump), Alan Paterson (High Jump), Duncan McDougall Munro Clark (Shot Putt and Hammer) and Edith Anderson (Long Jump). The cgf website tells us that the opening ceremony was attanded by 40,000 spectators and that twelve countries sent a total of 590 athletes and two newly formed countries were appearing for the first time – Nigeria and Malaysia. There were nine sports contested: athletics, boxing, cycling, fencing, lawn bowls, rowing, swimming and diving, weightlifting and wrestling. Before the Scots team left for the antipodes, there were several previews of the team and its chances in the Games, but none mattered to the athletes more than Emmet Farrell’s in ”The Scots Athlete’. “The New Year period is the usual time for stocktaking by cross-country enthusiasts but this time our attention will be partly diverted to the forthcoming British Empire Games due between February 4th – 11th at Auckland, New Zealand. The Scots team should put up a good show, but best chances of titles should be held by Duncan Clark and Alan Paterson. Clark in particular should be a safe title, but Paterson will be up against Olympic champion JA Winters who is usually the acme of consistency. Alan however has the potential brilliance to defeat the Australian ace and their duel should be a most exciting one. It will not, however, be a two horse race as there are other jumpers in close proximity, chiefly Wells and Pavitt of England, and Canadian and South African first class exponents. 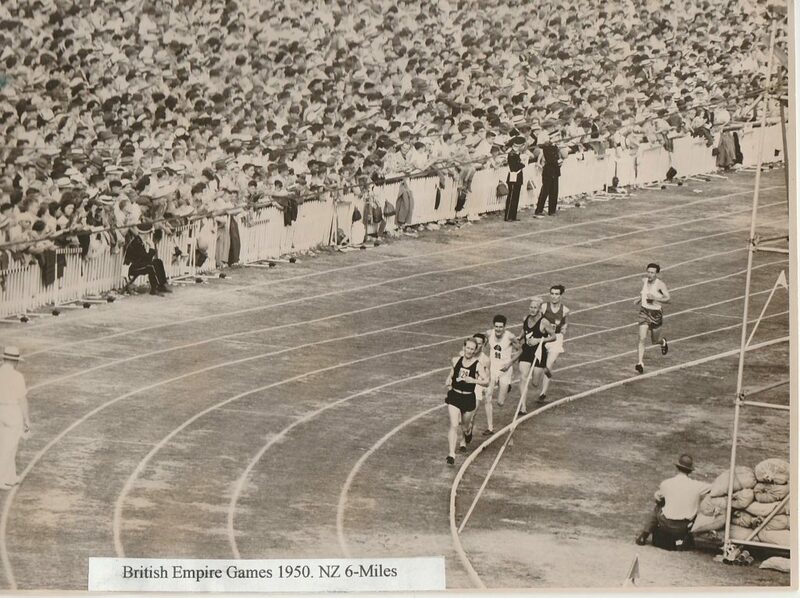 If Andrew Forbes can get down to his Scottish native record form of 14 mins 18 secs odd he has a distinct chance of an Empire title in the 3 miles despite the presence of miler L Eyre and that little terrier AH Chivers, both of England, and “Bill” Nelson, the short striding bearer of the silver fern. Andrew is also short listed for the 6 miles and if he elects to run in this event may put up a surprisingly good performance as I feel certain that he has great potentialities over this essentially speed-stamina test. Incidentally the Victoria Park man is in the main carrying on his cross-country training with perhaps a little concentration on speed work. This should be a wise move for after all he will be racing over a grass track at the Games. In the hop, step and jump, Dr AS Lindsay has formidable opponents to mention only two in Olympic runner-up George Avery and versatile Les McKeand, both of Australia. It is in Lindsay’s favour however that he was coming “bang” into form during the end of the season, his Scottish record it will be recalled being set up at the Edinburgh Highland Games in September last year. Our splendid young hurdler JGM Hart will do wonderfully well to earn a place in the 120 yards hurdles with among others the evergreen Don Finlay and Peter Gardiner of Australia who has clocked 14.1 seconds which compares more than favourably with the Edinburgh man’s best time of 15 secs dead. Our only Ladies representative, Miss Anderson of Dumfries, has been “on the up” and I am confident, despite lack of international experience, that she can beat the best of the English girls. However, I learn through Joe Galli that Miss Judy Canti of Australia at a recent meeting jumped 18 ft 11 1/2 ins and of her six tries was not lower than 18 ft 2 1/4 ins, so our Dumfries lass will have to pull something special “out of the bag”. After all the talking was done however, the team boarded the ship for Australia, and battle commenced on 4th February. The result of the six miles was not completed by the ‘Herald’. Forbes was timed at 30 min 31.9 sec while third placed New Zealander Noel Taylor was also timed at 30 min 31.9 sec. The next two runners were both Australians and they came home in 30:34.7 and 30:446.3. At home in Scotland on the same day, the West District cross-country championships were being held at Motherwell with Victoria Park finishing third team and Andy’s brother Chic being eleventh. The 6 miles in Auckland was very much out-of-season for Andy who, as we have seen, was the only athlete in the top five not from either Australia or the host country. The same was true of course for Paterson – in the years before indoor athletics the Scottish weather was hardly suited to training for field events. The first four were from Australie, Scotland, Nigeria and New Zealand. Forbes and Paterson however probably benefited from being flown out instead of sailing like the rest of the team – they were the first Scots ever to fly to a major Games meeting. The story is that Paterson and Forbes could not take the time necessary for the trip because of the constraints of their employers. Paterson, a chartered accountant, and Forbes, who worked for electronics company Philips, were funded by cinema magnate Sir Alexander King, to fly via Iceland, Gander, Hawaii and Fiji en route to Auckland. The flight from Prestwick took one week to get to New Zealand and the pair arrived two days after the main party sailing on the cruise liner Tamaroa docked in Auckland. That and the fact that their events were one first was probably an important factor in their success. Ian Hart (120 yards hurdles – 5th Ht 1; 440 yards hurdles – 5th Ht 1); Allan Lindsay (Triple Jump – 8th), John Paterson (marathon – 14th, 3:00:58.8) and the solitary female athlete, Edith Anderson (long jump – 6th 17′ 2″). Three medals from seven athletes was not a bad return, but for the views that mattered to domestic athletes who knew and competed against the Empire Games stars, we have to look at Emmet Farrell in ‘The Scoits Athlete’ of March 1950. “From practically every point of view, the British Empire Games at Eden Park, Auckland, New Zealand, now concluded have been a great success. Latge crowds attended and the contests were fought out in a keen but friendly spirit. Scotland’s band of track and field athletes did well to capture three medals – 1 first and two seconds. Duncan Clark was perhaps the personality of the tour as distinct from the Games. 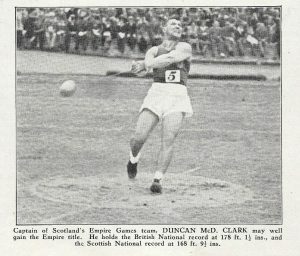 By throwing the hammer 163 ‘ 2 1/2″ in the championship, Clark not only won first place for Scotland but also set a new Games record. Even this was well below his best, but it must be remembered that Duncan was batting on a sticky wicket, heavy rain intervening just as his event was taking place. Subsequent to the championships proper Clark took part in a series of meetings in which he excelled anything he had yet done, culminating in his best ever throw of 181′ 3 1/4″, figures which would have yielded him a second place in the Olympic Games won by Nemeth of Hungary with 183’ 11 1/2″. 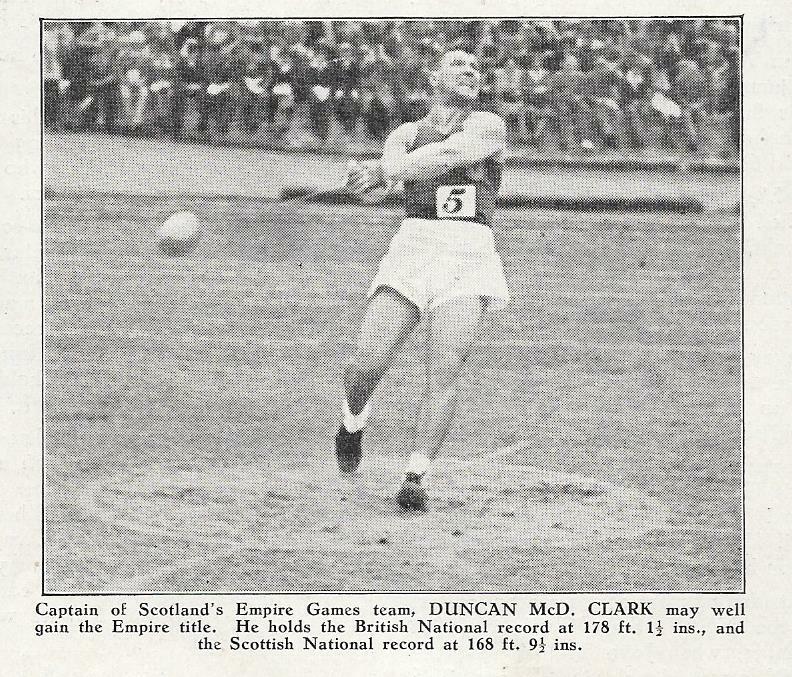 Clark, who is obviously still improving, is now the third Scot to win an Empire title, the others of course being D McL Wright (Marathon, 1930) and FA Hunter (440 hurdles, 1934). Meritorious second places were earned by Andy Forbes in the 6 miles and Alan Paterson in the high jump. The former’s bid was a glorious one. After a magnificent dust up with Bill Nelson of New Zealand, he was beaten by only 12 yards. Forbes’s time of 30 min 31.9 sec is inside the Scottish figures of 30:42 but, being done outside Scotland, the record is not affected. The 3 miles event was too near the 6 miles for Andy to regain his strength and best form and it is small wonder that he had to taper off. Alan Paterson’s performance, though good, was a trifle disappointing inasmuch as it was felt he had a strong winning chamce. Winter of Australia who won, is of course Olympic champion and a most consistent athlete who seems to be at his best on the big occasion. In addition he had defeated Alan every time they met. His leap of 6′ 6″ was the same as won him the Olympic title. Paterson appears the more potentially brilliant performerbut so far lacks the consistency of the Australian ace. Still, his 6′ 5″ effort shaded Pavitt and Wells, the other British contenders. These were the last British Empire Games ever – four years later in Vancouver they became the British Empire and Commonwealth Games, which title they kept until 1970 when they became the British Commonwealth Games. The Commonwealth grew somewhat thereafter by other countries wanting to join and so the Games became the Commonwealth Games in 1978.